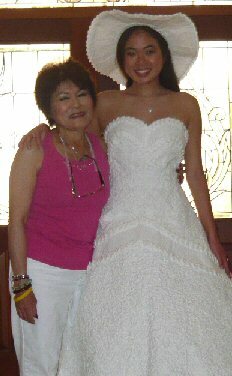 The 2009 Toilet Paper Wedding Dress Winner! 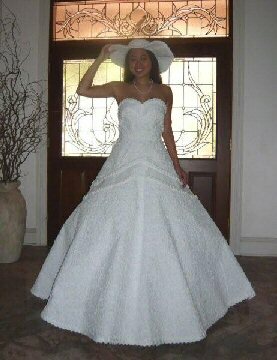 In 2005, Cheap Chic Weddings hosted a contest to create a toilet paper wedding dress. This contest has been held consecutively since then. This year (2009) has produced one of the most beautiful and amazing entries yet. I was lucky enough to get in touch with this year's winner, Ann Kagawa Lee of Hawaii. She was gracious enough to answer Bride Craft's interview questions about her toilet paper wedding dress entry. Bride Craft: Ann, tell us a little about yourself. Ann Kagawa Lee: I am a retired attorney, licensed in California and Hawaii. I am a mother of 3 adult children and 3 grandchildren. I have always had a passion for designing and sewing clothes, especially formal dresses. I have been sewing since I was 13 years old. Now that I am retired, I want to do things I enjoy, and sewing is one of those things. 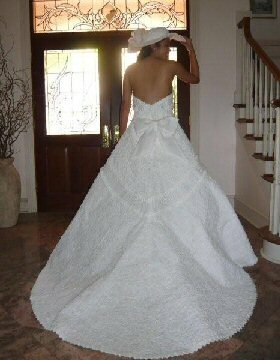 BC: This is not your first time creating a toilet paper wedding dress for this contest! What was your first experience like? And what made you decide to come back for more? Ann: My first experience creating the toilet paper wedding dress last year was a fun project, which I did in 2 weeks while working full time. I placed 3rd in the 2008 Cheap Chic Wedding Dress Contest, and I wanted to give it another shot to take the top prize this year in light of my recent retirement. I also had a design idea since last year of making a hat, and I wanted to put that idea to the test. BC: You won a great $1,000 prize for creating this novel dress! But how much money did you spend to create the dress itself? Ann: I spent approximately $24.00 - $20.00 for the shipping tape and $4.00 for the glue gun sticks. I did not have to purchase the toilet paper rolls since I used the free toilet paper that I received with the coupons for 2 free packages of Charmin toilet paper that I got for submitting my entry in 2008. BC: And how long did it take you, from start to finish? Ann: I started working on the origami triangles for the trim beginning in February of 2009. I worked on that sporadically and folded 750 triangles, spending a total of 40 hours. I made the hat in two days in March and spent no more than 10 hours on the entire hat. I worked on the dress itself from April 17, 2009 until June 1, 2009, spending a total of approximate 100 hours. BC: Did the dress come out as you had anticipated? What sort of difficulties did you have? Ann: My dress turned out better than I anticipated. I had numerous difficulties. It was a challenge to keep the toilet paper attached to the tape because over time, the adhesive would lose its strength and toilet paper would start to pull away from the tape. It was also difficult to join the pieces without making it look like a stiff plastic sheet and more like fabric. Fitting the dress on to my model and keeping it taut on her body just with pins proved to be a hurdle. Transporting of the dress for the photo sessions with my model and to Florida for the judging still keeping the dress in tact was a problem. BC: How many tolls of toilet paper did you use to create your delicate masterpiece? Ann: I used between 15 and 18 toilet paper rolls, and this included a lot of rejected parts that I could not use because I did not like the fit or the look. BC: Since you became involved in the contest, what sort of feedback and responses have you gotten from friends and family? And have you experienced any celebrity from this experience? Ann: I have gotten a lot of positive feedback from friends and family who have been proud of me. I have received many email messages and phone calls. I was also featured in a local t.v. news coverage as well as in numerous national and local news clips. I got my 5 minutes of fame, which has been fun. I have not used this exposure to launch my design avocation, which could still be a possibility. I may get bored in retirement and may need to let my design ideas fly. BC: Your toilet paper wedding dress is now permanently on display in one of the Ripley’s Believe It or Not! Museums…do you know which location now has your creation? Ann: I was told that it is being displayed at the Orlando, Florida Ripley’s Believe It or Not! Museum. BC: What neat and crafty things will you do in the future? Any more wedding related crafts on the horizon for you? Ann: I have a lot of ideas to create crafty things, but I have not pursued any of these ideas. I have been asked if I would like to make wedding and bridesmaid dresses. I have not decided what I am going to do with the rest of my life. Whatever it is will be fun. Return Toilet Paper Wedding Dress Interview to the Article Library.